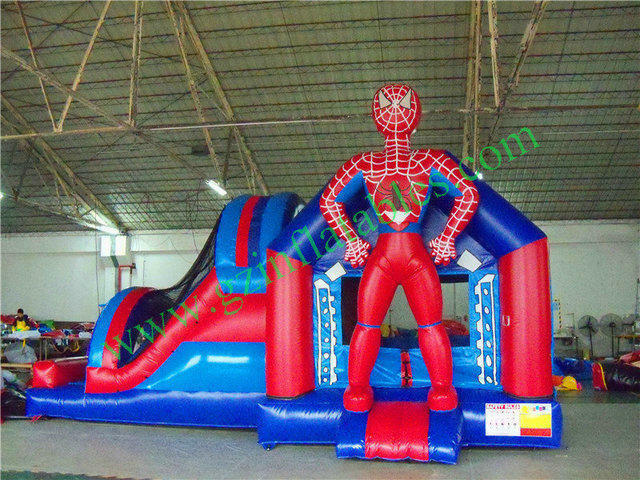 Kids of all ages will love jumping in this 3D Spiderman inflatable moon bounce Combo. This jumper can hold up to 8 kids and will make your party a huge success. The inflatable jumper is the perfect way to combine fun and healthy activity, and will add value to any Party Rental or Indoor! With a variety of colors, shapes and themes, our moonwalks offer kids of all ages exciting aerobic activity. This jumper has 360-degree mesh windows, so parents and spectators can have a clear view of all the fun. Our bouncy castles are made safe and secure with lite n strong™, fire-resistant vinyl making it safer, portable and more durable.